The traceability of the olives is vital, choosing the right moment to harvest is an art. Of certified Italian origin, harvested early in the season and cold pressed, our extra virgin olive oil comes in 3 references: Organic, the DOP Colline Salernitane and Extra-Virgin. Our oils are created by using natural olives, cultivated in Italy and harvested at the best moment, early on in the season, to then be mechanically cold-pressed in a Frontoio. An emerald-coloured oil, rich in anti-oxidants and vitamin E. This olive oil is the fruit of a harvest early on in the season, when the olives are still green, in order to preserve the powerful aromas. Its harmonious balance, both gustatory and olfactive, gives it fruity, spicy notes and a delicate hint of artichoke. 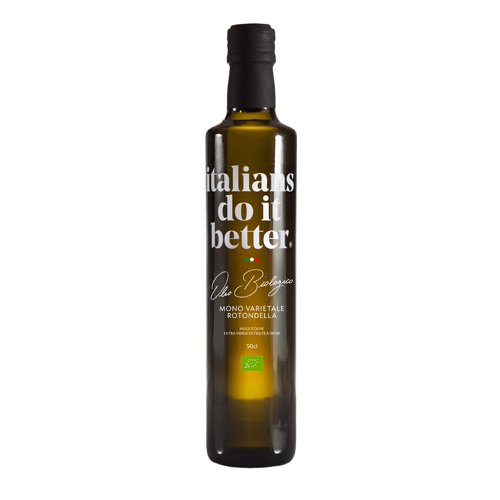 The AOP Colline Salernitane olive oil combines the riches of a secular heritage with innovative extraction techniques. This alliance between tradition and modernity is enhanced with the original and delicate flavour of this olive variety. An intense green oil with a medium fluidity. This fruity olive oil reveals aromas of greenery and almond notes. It is balanced with spicy and bitter tones that are instantly perceptible.